With more than 364 million members in over 200 countries, LinkedIn is the world’s largest digital professional network. What’s more, according to a LinkedIn study, 80% of LinkedIn members say they want to connect with companies on the platform. These statistics are strong indicators that LinkedIn Company Pages are an important channel for communicating with existing and potential customers, job candidates and your broader professional network. To that end, we’re pleased to introduce new LinkedIn targeting functionality—as well as comprehensive design updates—to Sprout’s publishing tools to help facilitate more effective social communication between your business and your professional community. Sharing job opportunities with relevant candidates with seniority or job function targeting. Posting updates about local events or regional company news with geography targeting. Publishing thought-leadership articles and other topical content to a tailored audience with industry or company size targeting. It’s important to note that in order to publish a targeted status update on your LinkedIn Company Page, you must have at least 100 followers in the targeted segment. As you apply more targeting criteria across the various target segments, you will be narrowing in on a more refined subset of your followers. 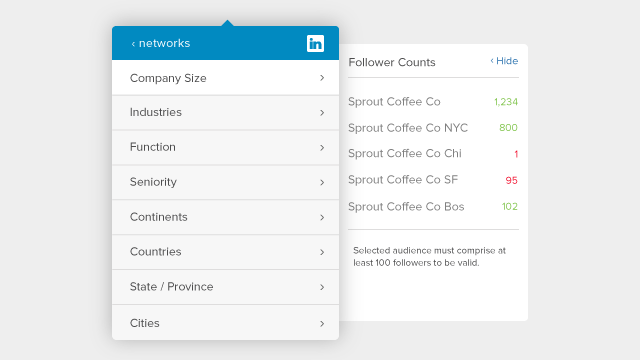 Whether you’re publishing to one LinkedIn Company Page or several, the Follower Counts tray will help you understand if your chosen targeting segments meet the 100 follower minimum. 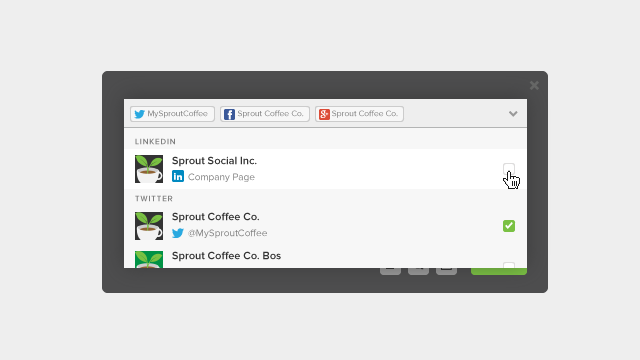 We’ve also redesigned the entire user-flow for targeting posts on Facebook and Twitter. The new flow is super intuitive and will make targeting network specific and syndicated posts a seamless process. 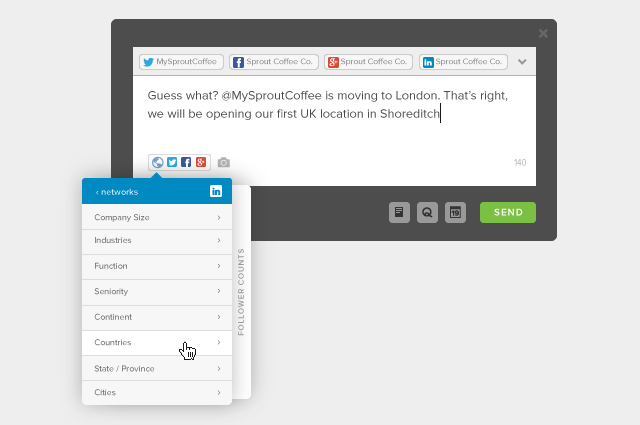 In addition to the new targeting user-flow, we’ve revamped the Compose window. It’s now easier than ever to schedule and post messages to multiple networks simultaneously and leverage unique targeting options for each individual network—all from a single intuitive Compose window. We’ve cleaned up the profile-picker menu and repositioned the icons for targeting, image attachment and character count. These updates all make room for a larger text input area so you can focus on the task at hand: composing a great message to share with your audience. Also, when creating lengthier posts for Facebook or LinkedIn Company Pages, the entire Compose window now expands as you type, allowing you to view more of your message without having to scroll. By continually improving our social publishing tools, Sprout is able to enhance and refine your social publishing process—saving you time, boosting engagement and ultimately providing a platform to more effectively power social communication. As always, let us know if you have any questions or feedback.